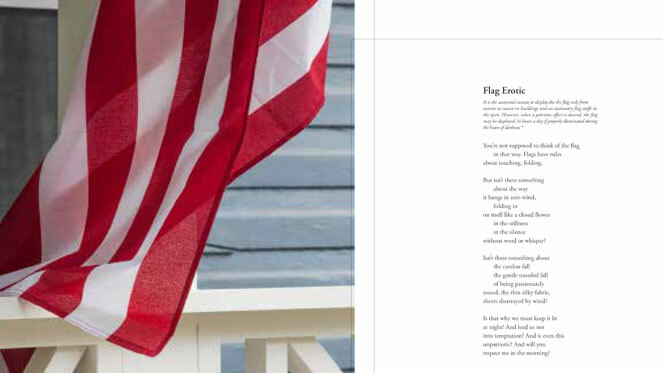 Carnegie Mellon University’s Charlee Brodsky and Jim Daniels have teamed up again, this time using photography and poetry to explore the American flag. Their latest project brings into focus everyday appearances of the flag in working class neighborhoods and sparks a dialogue about belonging, patriotism and individual expression. Brodsky, a professor of photography in the College of Fine Arts, sensitively captures scenes of the flag in Pittsburgh neighborhoods, while Daniels, the Thomas Stockham Baker University Professor of English in the Dietrich College, thoughtfully explores diverse, sometimes complex, feelings of identity. Spurred by the turbulent presidential election year, Brodsky began photographing flags in a variety of contexts. She told Daniels about her project as something that might interest him, as a poet who likes "to play the ideal off the real." "Flags are symbols, but they are also concrete objects that are displayed by a variety of people and institutions in a variety of ways that sparked my imagination as a writer, as an American, and as a human being. Fifty stars, thirteen stripes, red, white and blue. That stays the same, but everything else changes from photo to photo, and, I hope, from poem to poem," Daniels said. Two pieces were recently displayed at the Atwood Street Window Gallery in Pittsburgh's Oakland neighborhood. "As a collaboration, the photographs and poems work off each other and open up the ways that each can be read. Neither illustrates or explains the other; there is a relationship in the pairing, but the paired works then pull the viewer off in different directions, one visual and the other through language. That is quite a powerful combination," said Leo Hsu, the gallery's curator and an adjunct professor of photography and history at CMU. Brodsky and Daniels would like the project to become a book. They share an interest in urban environments and have partnered on a number of projects over the past 12 years. The books from their past collaborations include “Street” (Bottom Dog Press, 2005) and “From Milltown to Malltown,” with writer and CMU English Professor Jane McCafferty (Marick Press, 2011). An art gallery at Michigan State University College of Law will exhibit their latest work, under the working title “American Patriot,” in 2017.